On Thursday, July 19th, Nashville’s mayoral candidates will participate in a forum hosted by New Americans, Friends, & Supporters. The forum will take place from 7:00 to 8:30pm at the University School of Nashville. 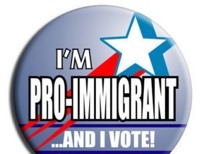 Based on estimates of the number of naturalized citizens and U.S. born children of immigrants, there will be approximately 131,500 New Americans in Tennessee who will be eligible to vote by 2008 (93,164 in 2004, and an additional 38,300 by 2008). With 25% of Tennessee’s immigrant community living in Davidson County alone, the importance of these community members on Nashville politics is becoming increasingly clear. “We are very pleased to see Nashville’s mayoral candidates take such a strong interest in the growing New American community, and recognize the need to address the concerns of immigrants themselves,” said Ahmed Dahir, civil liberties organizer at the Tennessee Immigrant and Refugee Rights Coalition (TIRRC). “Immigration in Nashville is relatively new, and we are at a transition point where many New Americans are obtaining their citizenship and becoming eligible to fully participate in the electoral process. These community members promise to play an essential role in our city’s future,” said Cristina Allen, the forum’s moderator. This event is being hosted by: Catholic Charities, Conexion Americas, Ethiopian Community Association in Nashville, Health Assist Tennessee, India Association of Tennessee, Metro Nashville Human Relations Commission, Middle TN Hispanic Democrats, Islamic Center of Nashville, Nashville Area Hispanic Chamber of Commerce, Philippine-American Association of Middle, Somali Community Center of Nashville, Sudanese Community and Women Services Center, TN Foreign Language Institute, TN Hispanic Chamber of Commerce, TN Hispanic Voters Coalition, TN Immigrant & Refugee Rights Coalition, and the TN Korean-American Citizens Organization of Tennessee.